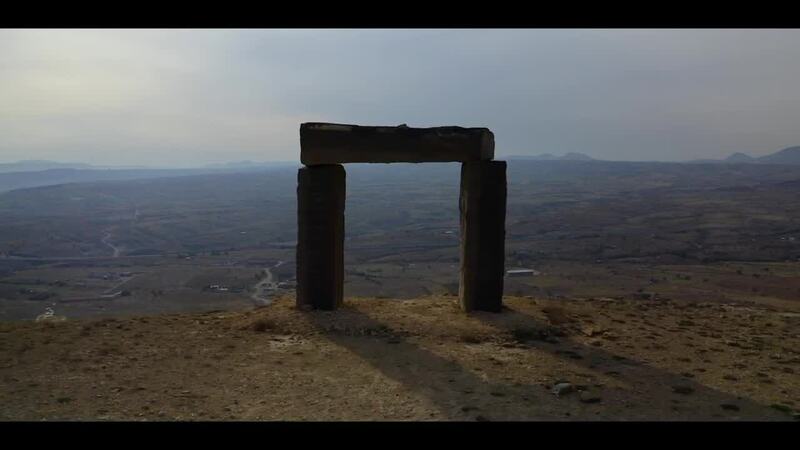 Description: Time and Space, Turkey A video about the creation of the ‘Time & Space’ land art park in Cappadocia Turkey by Andrew Rogers over a period of four years. Rhythms of Life is located in Cappadocia, near the World Heritage-listed rock formations and cave dwellings. The completion of Rhythms of Life was accompanied by freezing temperatures and snow. General Info : Cappadocia, ancient district in east-central Anatolia, situated on the rugged plateau north of the Taurus Mountains, in the centre of present-day Turkey. The boundaries of the region have varied throughout history. Cappadocia’s landscape includes dramatic expanses of soft volcanic rock, shaped by erosion into towers, cones, valleys, and caves. Rock-cut churches and underground tunnel complexes from the Byzantine and Islamic eras are scattered throughout the countryside. Neolithic pottery and tools found in Cappadocia attest to an early human presence in the region. Excavations at the modern town of Kültepe have uncovered the remains of the Hittite-Assyrian city of Kanesh, dating from the 3rd millennium bce. The tens of thousands of clay tablets recovered from the remains of an Assyrian merchant colony at Kanesh are among the oldest written documents discovered in Turkey. The earliest appearance of the name of Cappadocia dates from the 6th century bce, when Cappadocia’s feudal nobility was dominated by a Persian satrapy and Zoroastrian temple cults were widespread. Because of its rugged terrain and modest agricultural output, the area remained underdeveloped in antiquity, with only a few significant cities. Alexander the Great bypassed Cappadocia but sent troops under his general Perdiccas (322 bce). After a power struggle following Alexander’s death, Cappadocia fell into the dynastic orbit of the Seleucids, although a local aristocracy descended from the Persian satraps continued to rule and Persian religious practices persisted. Cappadocia transferred its allegiance to Rome after the Roman victory at Magnesia (190 bce) and remained faithful despite the Pontic and Armenian attacks of the 1st century bce. Cappadocia was retained as a Roman client state until Emperor Tiberius annexed it in 17 ce for its command over strategic passes in the Taurus Mountains. The region had early contact with Christianity. The Acts of the Apostles reports that Cappadocian Jews were present in Jerusalem during the descent of the Holy Spirit on Pentecost (Acts 2:9), and the First Epistle of Peter mentions Cappadocia among the persecuted Christian communities of Asia Minor (1 Peter 1:1). In the 4th century three Cappadocian theologians—Basil the Great, Gregory of Nyssa, and Gregory of Nazianzus—made important contributions to Christian thought in their writings, refuting Arianism and elaborating on the doctrine of the Trinity. Cappadocia’s position on the eastern side of the Byzantine Empire left it open to attack. Raids by tribal groups in the 5th century spurred the construction of heavier fortifications in the area. In 611 an incursion by the Sāsānian army ravaged the Cappadocian capital, Caesarea (modern Kayseri). Arab raids into Cappadocia commenced in the 7th century and continued into the 10th. During these periods of instability Cappadocia’s large complexes of man-made caves and tunnels may have been built or expanded from existing structures for use as refuges. However, establishing precise dates for their construction has proven difficult. Cappadocia enjoyed a period of prosperity in the 10th and 11th centuries that led to a surge in the construction of rock-cut churches and monasteries. Many of the surviving churches from this period are richly decorated. The Byzantine Empire lost Cappadocia permanently when it came under the control of the Seljuq Turks about the time that they defeated the Byzantine army at the Battle of Manzikert in 1071. The name Cappadocia is now commonly used in the tourism industry to refer to the area that extends roughly from Kayseri west to Aksaray (95 miles [150 km]), where the largest number of monuments are situated. The most-visited attractions include the sprawling underground cites of Derinkuyu and Kaymaklı and Göreme National Park, where there are a large number of rock-cut churches and dwellings. In 1985 Göreme National Park and other rock sites in the area were designated a UNESCO World Heritage site.